Why did you start riding a bicycle? Who are the people that influenced you? I’ve been giving these questions heavy consideration as I think about the reasons that I started to ride and continue to do so today, especially when I see the numbers showing how few people ride bikes. While the data I’ve come across varies, it shows that around 3 percent of the overall D.C. commuter population are cyclists. Another figure I have read is that that women make around 30 percent of the bike trips in the District. 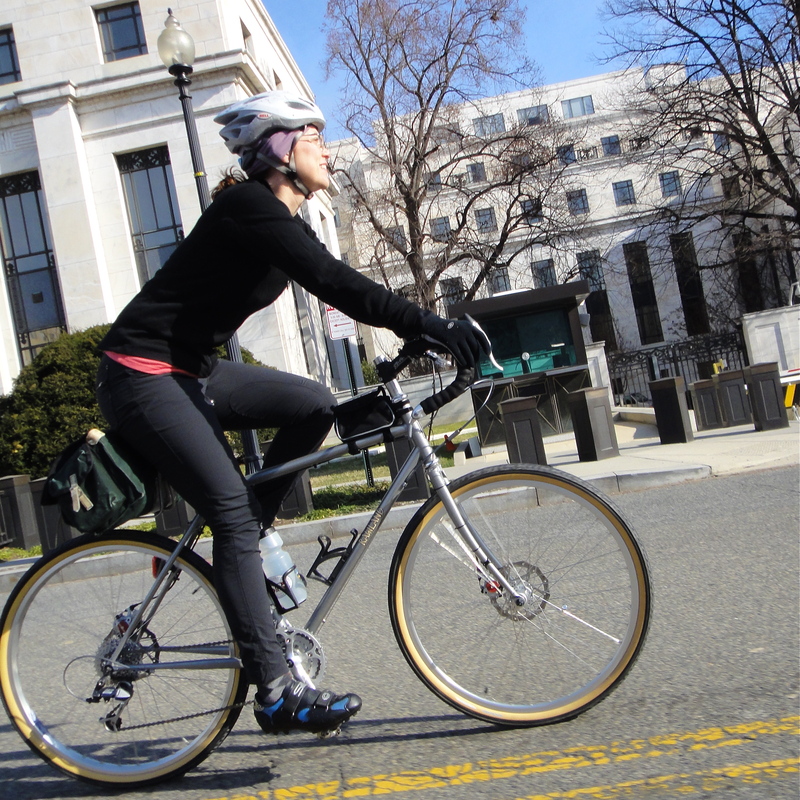 The League of American Bicyclists published data stating that 32 percent of D.C. bike commuters were women. I don’t know all of the reasons why more people don’t ride, or why so many fewer women than men cycle. However, when I think about the reasons that I began pedaling around and continue to do so today, I see the huge role that people around me played in my development as a bike rider. My story starts in a small town in the Midwest. A place where everybody knew everybody and the edge of town was always within sight, no matter where you found yourself standing. The first group to pique my interest in cycling were the “big kids” in town. Kids slightly older than I who had made the leap to riding a bicycle. Man, I envied them. No longer constrained by their two feet, they had wheels to take them from one end of town to the other. They had left their Big Wheels behind for bigger and better things. I watched them zip up and down the street at a pace I could only imagine. I wanted to be one of the big kids. After I added a bicycle to my wish list, my parents gathered the money together for me to have one. Initially equipped with training wheels, they watched my progress as I toodled unsteadily up and down our unpaved driveway. Eventually, the training wheels came off. I practiced doggedly, out of view of prying eyes so no one (especially not my sisters) could monitor my progress. After hours of practice, I made the triumphant transition to big kid on two wheels. My sisters were not far behind in mastering bicycling basics, and as we grew more confident on the bike, Mom and Dad organized occasional family rides. These rides extended my radius past the edge of town to the county roads beyond it. Our parents exhibited great patience, teaching us how to cycle safely, and herding us slowly along the outskirts of town as the farm traffic passed us by. I will always be grateful to them for encouraging us to get outside, be active, and explore our surroundings. My sisters and I were each other’s constant companions growing up. Being close to me in age, we reached many developmental milestones perhaps not simultaneously, but within months of each other. If one sibling mastered something new, more than likely the other two took an interest in it, too. I learned to ride, and Middle Gersemalina soon followed. It wasn’t always fun to ride alone so we spent many hours riding together. We challenged each other to try new things, like skid stops and riding no-handed. Sometimes our trips were short jaunts to the park. Other times we meandered, exploring the streets together. I took up riding again as an adult for various reasons, primarily because I saw how useful it was for transport around Washington, D.C.
As I regained my cycling skills and my fitness increased, I developed an interest in bike touring. Growing up, my home state hosted the largest cross-state cycling tour in the country the Register’s Annual Great Bike Ride Across Iowa (RAGBRAI). None of us lived in Iowa anymore, but I suggested it to my sisters as a way for us to simultaneously catch up with each other and reconnect with our home state. We made arrangements to ride it together that summer. Our mom even agreed to follow the route (by car) and carry our cycling gear from town to town. Ultimately, only one of my two siblings was able to ride it, but we loved it. There is nothing quite like seeing people come from all parts of the country to ride in the state where you spent your childhood, especially when tourism is not a big draw to that part of the country. My sister and I liked RAGBRAI so much that we did it together a couple of times. During one of my RAGBRAI trips, I met an avid D.C.-area cyclist, Andrea M. She took me under her wing after RAGBRAI, and introducing me to road riding and the great places to ride outside of Washington, D.C. She showed me the roads around Poolesville, Maryland; the popular cycling highway that is River Road; and Sugarloaf Mountain. Up until that time, my D.C. riding had been limited primarily to multi-use paths. Thanks to Andrea, a whole new cycling world opened up to me. 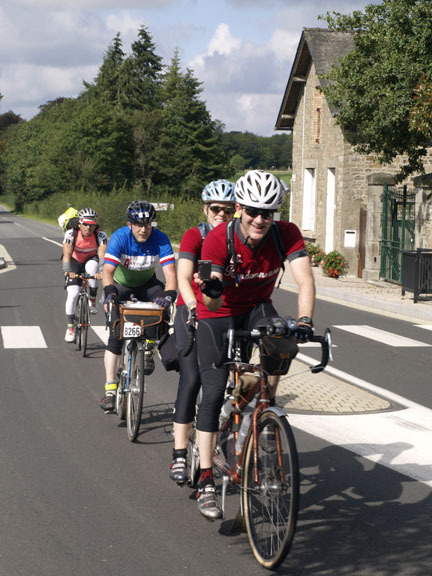 I even discovered randonneuring when Andrea invited me to be part of an all-woman fleche team. Because of Andrea, I reacquainted myself with groups of people who liked riding for sport and recreation, and in the process I realized how much cycling meant to me. I loved meeting people who shared my passions for being active. It was through this group that I met my tandem partner, and now-husband, Felkerino. Felkerino not only possessed knowledge about good places to cycle, but he was also a smarty-pants about how the bicycle worked. He taught me enough mechanical skills to muddle through basic roadside repairs (emphasis on basic). Felkerino and I also learned the ins and outs of light/”credit card” bicycle touring together, thanks in large part to some of our randonneuring friends who welcomed us to tour with them. They taught us about route and distance planning, and how to plot one- to two-week tours. Felkerino and I then set off on our own, basing our routes on much of the touring knowledge we acquired from then. In a time where so much information is available to us and often only a keyboard click away, I have found that it can only take me so far. Ultimately, I needed the people around me, the spokes of my wheel of influence, to send me on my way. They taught me about the bicycle and fostered my cycling pursuits. They invested their time in helping me. It’s hard to imagine where I would be without them. I’m forever grateful to the many people who opened my world to bicycling, and to those who continue to influence and inspire my two-wheeled adventures. My biggest influence was my father. I started cycling on BMX bikes young. But Dad bought me my first bike with gears for my tenth birthday and took me on a 60km (40mile) ride about 2 weeks later. It was the most fun I’d had. I’m only now getting into longer distances (100km+) but that first long ride is still where I draw inspiration from. RIght? I don’t think we ever forget it. I remember as a kid riding my Schwinn really fast then jumping off just to see how far it would go before wobbling to the ground. That bike was indestructible! My love of cycling has been growing more and more over the years after having bariatric weight loss surgery in 2009. Then I weighed in at 358 lbs. I am now at 198 lbs, and am looking to lose more. I have to thank you for this blog, it is because of this and others like it that I have joined RUSA. I am trying to get in contact with my local group NJRANDO and start there. I go to Washington DC at times and would enjoy to ride with you guys sometime. I’m so glad, and congratulations on your weight loss! 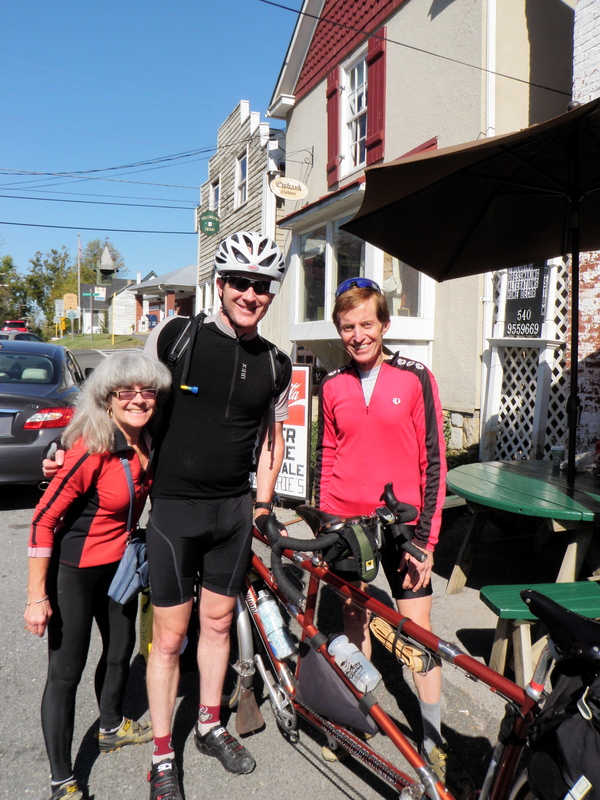 We have ridden with some of the NJ Randos and have found some good people in that club. Good luck with your riding, and I look forward to hearing how it’s going! Getting in touch with NJ Rando is just a web site away. Keep an eye on NJRando dot com especially in early March as the new rides begin for the season. I had a similar experience with the neighborhood kids racing around on two wheels while I was on training wheels. I was determined to learn how to ride my bicycle, and my dad helped me. It’s amazing how powerful the neighbor kids can be on putting an idea in a person’s head! Great article! I spent most of my time running until I met my husband George, who was a cyclist. The first year we were together he ran 5 marathons with me. His payback was having me join him for Bike Tour of Colorado. I ended up loving it! In fact, my brother, who I was out of touch with, was also an avid cyclist. With my new interest in cycling, we started meet up at least once a year for a cycling tour. I love the people I’ve meet through cycling. That’s so cool! I’ve felt so fortunate that I get to share my love of cycling with my husband, and that I keep meeting new and interesting people through riding. Ah, great piece. This brought back lots of early bike memories for me. I learned to ride on a bike with ONE training wheel, at a baby sitters’ house. From there I took over my mom’s 3-speed. I was only five so it was ridiculously huge. I got my Schwinn with the flowered banana seat shortly after that. Great memories. That is too funny… one training wheel!? And I am so jealous of your flowered banana seat!! I’m a rando spouse, mother of three, and life-long, though small scale, cyclist (no Rando length events for me yet). This post struck a chord with me as a small town Nebraska girl. As the youngest of 6, all of my early bikes were hand-me-downs. As I got older and my friends and I used our bikes to go everywhere, I began to wish for better wheels. When I was 13, I used a whole summer worth of detasseling money to buy myself a red Raleigh 10 speed. I loved that bike – it was like having wings. I rode it all over town, out of town, to school, to the Dairy Queen, the pool, babysitting jobs, the library, on my paper route, to baseball games, and eventually I even figured out how to kiss my high school boyfriend while riding…all of my world was at my disposal with my bike. I grew up, moved away and after college landed in DC….where I did not ride a bike…it just seemed like too big a place for a bike. Shortly after meeting my husband, he encouraged me to buy another bike and I began again, to ride with him. I’ve had that bike for 20 years now and it has lots of miles on it carrying me, and all three of our children in every kind seat, trailer, and trail-a-bike. In the next couple of weeks a group of girlfriends and I, all celebrating our 50th birthdays, are heading off on a longish bike adventure…my bike still gives me wings.